The weeklong celebration commenced last March 28, 2016 with the distribution of giveaways ranging from assorted grocery items to its paying concessionaires and the distribution of the BCWD Anniversary t-shirts to the first 42 paying concessionaires, signaling the formal opening of the twin Celebration. The conduct of the institutional contests such as the 12th Photo Contest (March 16, 2016), 27th On-the-Spot Poster Making Contest (March 28, 2016) and 2nd Quarter Water Quiz Show (March 29, 2016) participated in by both elementary pupils and high school students, made sure that it was not only a celebration of sorts but also of imparting water education to the kids and the youth as part of BCWD’s advocacy program. Aside from the conduct of customer incentives projects and institutional contests, social outreach programs were also conducted. A Bloodletting activity was conducted on March 28, 2016 at the BCWD Conference Room facilitated by the Bloodletting Team and volunteers from the Philippine National Red Cross – Butuan City Chapter. A total of 34 bags of blood were donated to the PNRC. Last March 29, 2016 was the annual visit to Por Cristo in Abilan, Buenavista, where a short program was prepared especially for the 40 lolos and lolas. Aside from the program, various grocery items, two (2) sacks of rice and 12 pcs monoblock chairs were also given to the Por Cristo. 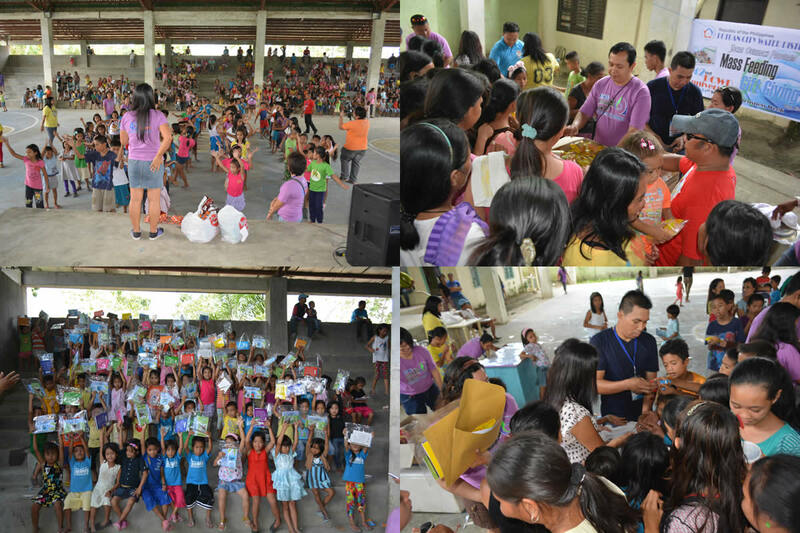 Simultaneously conducted on March 30, 2016 was the conduct of the Mass Feeding which gathered 303 under privileged and malnourished children ages three to eleven years old from Barangay Bit-os and were treated with an arrozcaldo with chicken and egg as well as given school kits comprising of notebooks, pencils, erasers and sharpeners. Meanwhile, another team from BCWD visited 19 orphaned kids at Balay Silonganan wherein they were treated with a sumptuous lunch and were given various grocery items and two (2) sacks of rice. As a culmination of the weeklong celebration, on April 1, 2016, BCWD will hold a Eucharistic Celebration at 7:00 a.m. followed by the Awarding Ceremony for the institutional contests at 2:00 p.m. in LJ Mega Convention Hall. The awarding ceremonies for BCWD meritorious employees, who earned distinction based on the number of years they have been punctual, have served the District and for the years they have consistently been with perfect attendance, will also take place on the same date during the Employees Night which will start at around 6:00 p.m. at the LJ Mega Convention Hall. Overall, the weeklong festivity is a manifestation of BCWD’s continuing dedication to improve its services and its drive to educate the young people about conservation as it is an essential element of BCWD’s integrated plans to meet the City’s water needs in the future.